My Ratling Gun in the Californian Sun. I gave this miniature my usual Skaven Clan Skryre colors look. My idea is that these Skavens, and especially those from weapon teams, should wear some ordinary ‘rug like’ clothes. No fancy colours, nor dyed fabric. Only brownish and grayish colours. After all they are tinkering and fixing some miraculous Clan Skryre machines all the time. There’s no point to wear colorful clothing. For little containers on the back of second Skaven, and also for the feed to the gun – I used Khorne Red paint as a base color. Usually when I paint warp based weapons, I use Caliban Green as base, to simply represent the warpstone is involved here (I mean lot of warpstone!) This time though, I was thinking…hmm, maybe the Ratling Gun will be more like fiery weapon – where it’s more about fire blaze. So that is why I got the idea to change dark green glow for red and orange. I also added some smoke-black effect on the exit of the gun. After all these guns are hired by Skaven Warlords from Clan Skryre very often. I believe it was used for some time now, and had shoot many, many times. Let’s hope it will not explode any time soon. 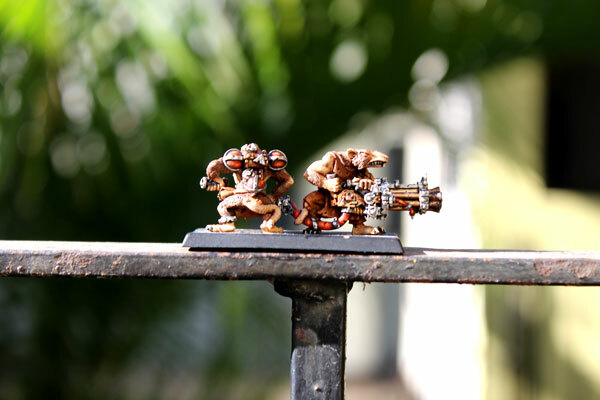 Skaven Ratling Gun, 2nd photo. 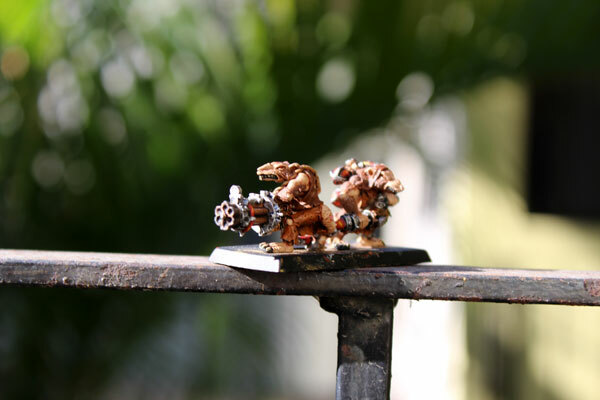 Anyway, my metal 6th Edition Skaven Ratling Gun is finally painted. And you know what? I really love it! I probably need to make a little update in my army list to include this exact Weapon Team. My 1250 point army is supposed to have only for two of them. One of my first battles, when I will be back to Poland will be probably against Warriors of Chaos. I wonder if Ratling Gun makes sense in such battle. They could release a massive amounts of shots with Ballistic Skill 3, Strength 4 and -2 Armour Modifier. With a little bit of luck, they could make a difference on the battlefield. I can see already those expensive fancy Chaos Warriors are dying like cannon fodder! But on the other hand I also love Warpfire Thrower and Poison Wind Mortar, so I don’t know. What is the best Skaven Weapon Team for you? Any help? Suggestions? And please, just don’t tell me the gun is unreliable – for me it’s huge advantage.. So much fun, when you are not sure what might happen next. Maybe it’s going to fire at my elite Stormvermins? Sorry fellows. Clan Skryre sends their regards; our inventions are not for whiners. After all Skaven life is cheap. No basing. I don’t even paint my bases. When I will be back to Poland, I will get some cool bases for all my Skavens. Slaves, Clan Rats and obviously Weapon Teams. Check my ideas for Skaven basing in one of my recent posts. Beware of latest invention of Clan Skryre. 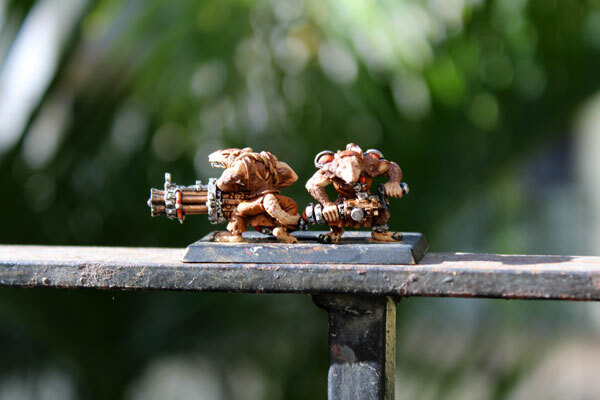 Skaven Weapon Team – Ratling Gun! Next in the painting line are Stormvermins again. Last two of them. They are almost finish, but the only problem is, I’m again in new place. 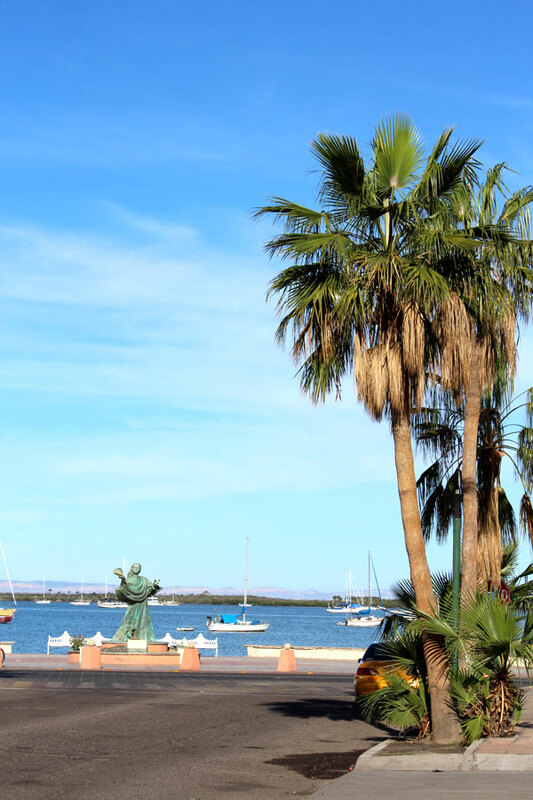 Right now La Paz, Baja California, Mexico. And why it’s a problem? Distractions again. Yesterday there was 30 degrees Celsius. The sea coast is so close, and for today I have plans to go for the day trip to see whale sharks and sea lions:). Poor Stormvermins have to wait. Not for long, I hope. Tomorrow I’m planning to finish them, and finally my regiment of 25 Stormvermins will be ready. And one final thought – I believe there is big chance, there will be no Ratling Guns in 9th edition of Warhammer Fantasy Battle. To be honest, I don’t really care. If the 9th edition will be playable, and provide nice models, I will play it. But I will not gave up on older editions. I started from 5tth, and I’d like to get back from time to time to older editions (I think Ratling Gun appeared first time in 6th, right?). There were too many cool miniatures, to ignore previous editions. Very nice painting, and especially considering that you’re carrying all your kits around the world with you. For what it’s worth, I feel like the red tubing etc is a little too close to the brown fur and green could have provided a better contrast. But overall the work is really great and I look forward to seeing a full family shot at some point. I also want to say what a wonderful blog this is with photos of (to me) exotic places and also nice miniatures like these old Skaven. Next PostFinally! Warhammer Shop (in Mexico).